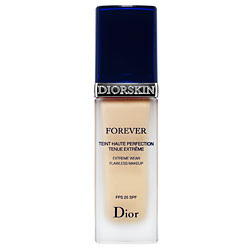 I’ve been using a small sample cup filled with DiorSkin Forever foundation I got from Sephora weeks ago, and I’m thinking that I might actaully have to buy it. I’m sent so much free stuff to review that I manage to stay stocked up on basics. That said, this foundation is really special. We aren’t talking tinted moisturizer coverage here, this is a medium to full coverage foundation that acts like a thin coat of paint disguising imperfections and turning your skin into an even canvas that’s ready for color. It isn’t heavy or goopy or thick, but its ability to cover and cling to the skin for hours is impressive given the light weight. As with most foundations, blending is key. Press it into the skin using a wet Beauty Blender (or makeup sponge) because using a foundation brush alone won’t cut it.